More seizing-the-day, more exploration, more adventure. New year, new resolutions. Every January rolls around and I feel mildly twitchy and on edge about any number of things I'm meant to be improving Right Now (the state of my cuticles, the number of times a week I find myself gyrating to a hopped-up 80's music in a class full of other Spandex-clad ladies, the amount of letters I hand-write to my acquaintances, and my determination to make this year the year I finally join a choir). I try not to get too caught up in the clean slate, fresh page thing, but it's hard. After a month of excess - too many truffles from gift baskets at the office, too much alcohol from one too many holiday parties, too many heavy meals that mark each celebration at the end of the year - it seems a given that January become an ascetic month. Early-to-bed, early-to-rise, frequent visits to the gym, main-course meals made of nothing but plants, and wholesale rejection of anything sweet... oh, it's all so dour. It's so much richer, though, and delicious than it sounds. 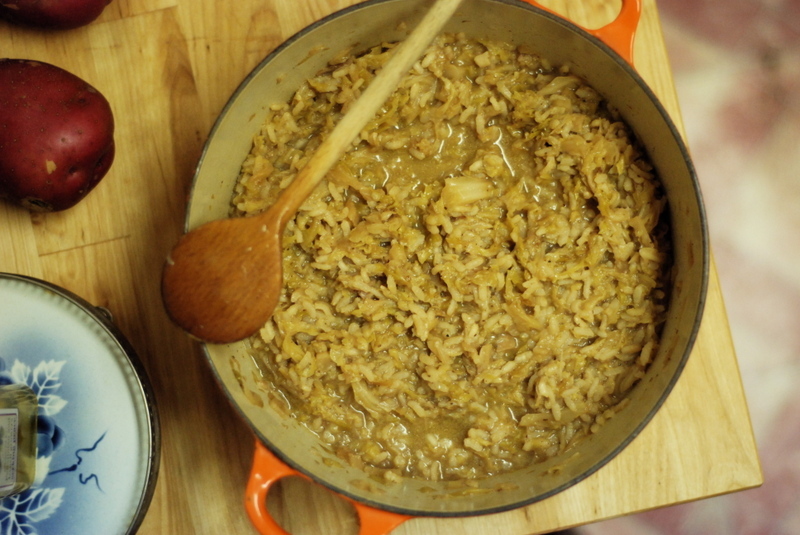 You shred cabbage and braise it within an inch of its life with a bit of vinegar (a Venetian treatment, this is). Then you take the whole lot of it (I know, it's rather wan. But so tasty!) and boil it with broth and rice into a soupy, sludgy stew. You beat butter and Parmesan into it, kind of like with risotto, let it sit for a few minutes and then you eat it. It fulfills quite a few January requirements - some low, slow cooking; a goodly amount of vegetables and just a wee bit of fat; and has the stick-to-your-ribs quality that you simply need when the wind howls around the corners and your pipes threaten to freeze. It's not much to look at, that's true, but who said January was pretty, anyhow? 1. Detach and discard the first few outer leaves of the cabbage. Shred the remaining head of cabbage very fine, either with your food processor's shredding attachment or by hand. Be sure to remove the cabbage's inner core. 2. Put the onion and olive oil and a large saute pan and turn the heat to medium. Cook the onion, stirring, until it's softened and taken on some color. Then add the garlic. When the garlic has turned a pale gold, add the shredded cabbage. 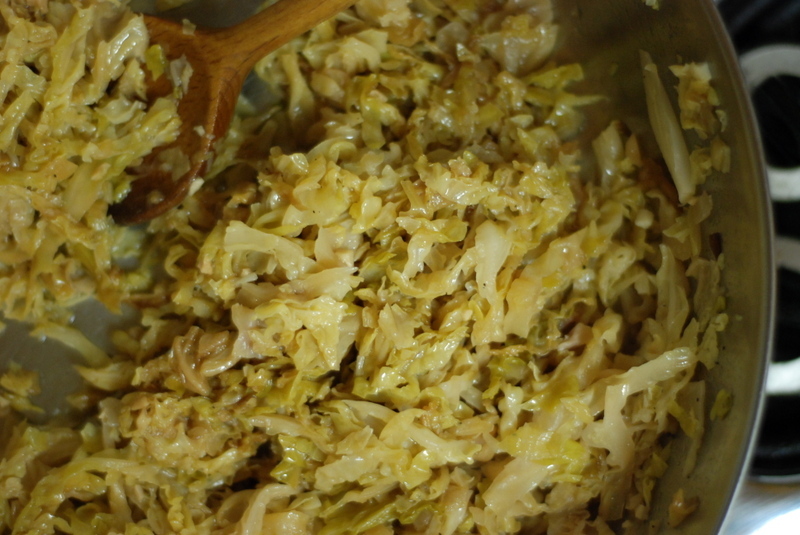 Turn the cabbage over 2 or 3 times to coat it well, and cook it until it has wilted. 3. Add salt, pepper, and the vinegar to the pan. Turn the cabbage over once, completely, then lower the heat to minimum and cover the pan tightly. Cook for at least 1 1/2 hours, or until it is very tender, stirring from time to time. Add 2 tablespoons of water, if needed, during the cooking if the cabbage becomes too dry. When done, taste and add salt and pepper to taste, if needed. Allow it to settle a few minutes off heat before serving. 1. Put the cabbage and broth into a soup pot, and turn on the heat to medium. 2. When the broth comes to a boil, add the rice. Cook, uncovered, adjusting the heat so that the soup bubbles at a slow but steady boil, stirring from time to time until the rice is done. It must be tender, but firm to the bite, and should take around 20 minutes. If while the rice is cooking, you find the soup becoming too thick dilute it with a ladleful of homemade broth or water. The soup should be on the dense-ish side when finished. 3. When the rice is done, before turning off the heat, stir in the butter and the grated cheese. Taste and correct for salt and pepper. Ladle the soup into individual plates and allow it to settle a few minutes before serving.